Multi-purpose high pressure, high temperature, air compressor lines, petroleum base or phosphate ester hydraulic fluid supply lines, Meets the requirements of SAE J1405 performance specifications for high temperature transmission and lubricating oil systems using petroleum base oils. Meets or exceeds the requirements of SAE 100R2 and SAE 100R2 Type S.
• Meets flame resistance acceptance designation “US. MSHA 2G”. • Hot oil / Pressure lines. 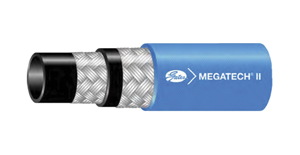 • High temp rotary / Air hose. • Hot oil / Pressure line. • High temp of 149˚c. • Very good pressure rating. • Meets or exceeds the requirements of SAE 100R2 and SAE 100R2 Type S.